High-Dose-Rate (HDR) brachytherapy (BT) treatment planning involves determining an appropriate schedule of a radiation source moving through a patient's body such that target volumes are irradiated with the planning-aim dose as much as possible while healthy tissues (i.e., organs at risk) should not be irradiated more than certain thresholds. Such movement of a radiation source can be defined by so-called dwell times at hundreds of potential dwell positions, which must be configured to satisfy a clinical protocol of multiple different treatment criteria within a strictly-limited time frame of not more than one hour. 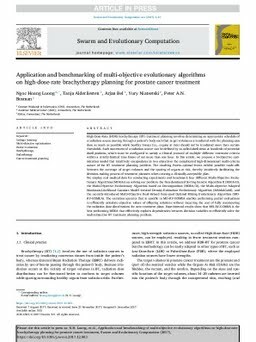 In this article, we propose a bi-objective optimization model that intuitively encapsulates in two objectives the complicated high-dimensional multi-criteria nature of the BT treatment planning problem. The resulting Pareto-optimal fronts exhibit possible trade-offs between the coverage of target volumes and the sparing of organs at risk, thereby intuitively facilitating the decision-making process of treatment planners when creating a clinically-acceptable plan.We employ real medical data for conducting experiments and benchmark four different Multi-Objective Evolutionary Algorithms (MOEAs) on solving our problem: the Non-dominated Sorting Genetic Algorithm II (NSGA-II), the Multi-Objective Evolutionary Algorithm based on Decomposition (MOEA/D), the Multi-objective Adapted Maximum-Likelihood Gaussian Model Iterated Density-Estimation Evolutionary Algorithm (MAMaLGaM), and the recently-introduced Multi-Objective Real-Valued Gene-pool Optimal Mixing Evolutionary Algorithm (MO-RV-GOMEA). The variation operator that is specific to MO-RV-GOMEA enables performing partial evaluations to efficiently calculate objective values of offspring solutions without incurring the cost of fully recomputing the radiation dose distributions for new treatment plans. Experimental results show that MO-RV-GOMEA is the best performing MOEA that effectively exploits dependencies between decision variables to efficiently solve the multi-objective BT treatment planning problem.